Speculation has abounded of late that Bristol-Myers Squibb is looking to do its largest acquisition ever – to add a crown jewel to its string-of-pearls. That’s the pharma’s loving nickname for an aggressive deal-making strategy in which it has lined up a series of about two dozen acquisitions and partnerships to complement its internal pipeline and existing products. These deals have largely been focused on cancer, cardiovascular disease, immunology, neuroscience, and virology. BMS has made only three acquisitions worth more than $1 billion since 2007 when the pharma first put this strategy in place, according to Elsevier’s Strategic Transactions database. Two out of three of them may eventually contribute substantially to the top-line. The most recent, of course, was the $6.8 billion joint acquisition in August of Amylin alongside BMS’ existing diabetes partner AstraZeneca. The idea was that the pair would put their marketing muscle behind a trio of classes of diabetes drugs. In the fourth quarter, its first full quarter of U.S. sales, BMS reported revenues of $55 million for Bydureon (exenatide extended-release) and $92 million for Byetta (exenatide). The partners hope to ramp up revenue as they expand their marketing effort internationally and roll-out a pen for Bydureon. Another BMS buy for over $1 billion was HCV play Inhibitex, which after a $2 billion acquisition early last year took a well-chronicled swan dive. Safety problems forced BMS to halt a trial for the lead acquired candidate. But BMS hasn’t given up on HCV; it’s targeting genotype 1b, which is prevalent in Japan where it accounts for 70% of HCV infection. BMS is currently in Phase III combination testing with NS5A inhibitor daclatasvir and NS3A inhibitor asunaprevir. Both of these are internal BMS candidates. BMS expects to present data from the trial at the American Association for the Study of Liver Diseases conference in November and to file for approval of the combo in Japan by year-end. The company is also testing that regimen in genotype 1b patients in the U.S. and Europe and pursuing triple and quad HCV combination treatments. Part of these could be Peginterferon lambda-1a, which BMS gained with its 2010 acquisition of ZymoGenetics for $841 million. So, that gives BMS one possible marketing-driven success and one outright failure among its big, recent acquisitions. The third big deal, for Medarex, has been an unabashed success. BMS acquired the biotech in 2009 for $2 billion, when its ipilimumab was in Phase III trials for metastatic melanoma. After a 2011 approval, Yervoy (ipilimumab) had 2012 sales of $706 million; it’s expected to become a blockbuster. BMS is looking to expand upon Yervoy's success. Immuno-oncology and HCV are its two top pipeline priorities, BMS said at this week’s Cowen Health Care Conference. Its immune-oncology line-up includes Medarex candidate anti-PD1 antibody nivolumab (in Phase III testing for melanoma as well as lung and kidney cancers) and elotuzumab (in Phase III testing for multiple myeloma). BMS has rights to the latter with partner AbbVie under a 2008 deal. The original deal was with PDL Biopharma, which then spun-out Facet, which was acquired by Abbott, which itself then spun out AbbVie. Wall Street expects that Yervoy, along with anti-fibrillation drug Eliquis (apixaban) and diabetes drug Onglyza (saxagliptin), could have blockbuster potential. Both Eliquis and Onglyza were discovered internally at BMS (and both are shared with partners -- Pfizer and AZ, respectively). But new blockbusters aren’t coming on-line quite fast enough to replace lost revenue. Of its current stable of seven blockbusters, BMS is already losing Plavix sales to generics and stands to lose patent exclusivity on three more within the next few years – anti-psychotic Abilify (aripiprazole), HIV franchise Sustiva and hepatitis B treatment Baraclude (entecavir). Even before the string-of-pearls, dealmaking was essential to portfolio building at BMS. It acquired Sustiva in its largest deal to date – the 2001 purchase of DuPont Pharma for $7.8 billion. Its rights to Abilify stem from a 1999 partnership with Otsuka. To do an even bigger deal, BMS would have to do some fancy wheeling-and-dealing. To execute on rumored buyouts of Biogen Idec with its $40.5 billion market cap or Shire with its $17.2 billion market cap, the $61.5 billion BMS would have to get creative and come up with a lot more cash than the $6.4 billion it had at year end. But, if nothing else, the Amylin transaction has shown BMS can do some creative deal-making. For now, Wall Street seems to think BMS has done a good enough job stanching its hemorrhaging sales. Since announcing its 2012 net sales declined 23% to $4.2 billion on Jan. 24, BMS shares have climbed 8%. That brings its year-to-date rise to 16%; a reversal of the 8% decline in 2012. But rather than speculate further about BMS' dealings, let's take a look at actual deals that have transpired in this edition of . . .
Targacept/AstraZeneca: North Carolina biotech Targacept and its Big Pharma partner AstraZeneca have agreed to amend their partnership agreement once again. The companies announced March 5 that AstraZeneca will give back the rights to Targacept’s alpha7 neuronal nicotinic receptor modulating compounds. Previously, AstraZeneca had the right to any compounds Targacept developed for cognitive disorders and schizophrenia. The Big Pharma opted out of development of TC-5619, a selective alpha7 NNR in 2011. The two companies paired up originally in 2005 on AZD3480 (TC-1734). The companies previously chose not to pursue AZD3480 in schizophrenia or Alzheimer’s disease after poor results for two mid-stage studies, but continued development in ADHD. Development of AZD3480 was later stalled in favor of another compound. AstraZeneca has now returned all rights to this compound to Targacept. Galapagos/Roche: The partners went their separate ways, concluding a discovery partnership that was first started for COPD in 2009 and then broadened into fibrosis in 2010. Roche will pay Galapagos almost €6 million for work completed in 2012, bringing the total Galapagos received under the deal to €16 million in upfront and milestone payments. Galapagos has regained rights to all fibrosis assays and targets discovered; it hopes to find another partner. The biotech chalked up the partnership dissolution to Roche’s shift in therapeutic areas of focus. - S.L. 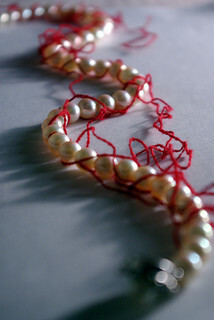 Entangled string and pearls photo courtesy of Flickr user bhollar.